Moisturizes and prolongs the tan. 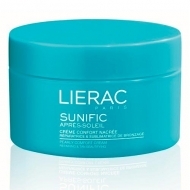 DESCRIPTION: Sunific Premium Baume Régénérant from Lierac is a regenerating anti-aging balm. This anti-aging post-solar care corrects the signs of photoaging, extends and sublimates the tan while comforting the skin and refreshes intensely. Specially formulated for mature skin. Face and décolleté. 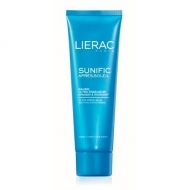 Enriched with blue micro algae extract with anti-aging and repairing properties. It contains bioflavonoids and a solution of pure hyaluronic acid that fills wrinkles giving a younger look. No parabens.